Andrew Neyman has a dream: he wants to be the best jazz drummer there ever was. And he has potential. But his mentor Terence Fletcher starts to realise it with methods that turn his world upside down. 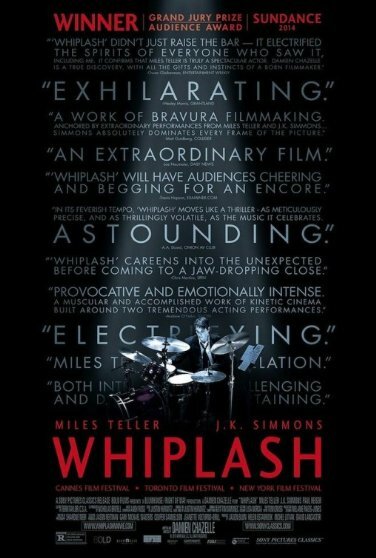 Whiplash is a fierce and unnerving jazz music drama: Andrew (Miles Teller) is struggling with a lot of things. He is shy, he is not the most popular guy out there, and his mother left the family at an early age. But he’s also sensitive, reasonable, ambitious, and wants to improve himself. Studying at a prestigious music conservatory seems like the best thing that could ever happen to him, but his teacher’s unconventional methods leave him in pieces, tear his world apart, and while certainly effective in some way, are not to be directed at the psychologically unstable. Everyone’s terrified of Terence Fletcher (J. K. Simmons), and rightfully so, but everyone also recognises him for the genius that he is. Or is he, really? And what’s a little drama if it gets you to the top? The film takes a rather uncommon approach to the area of (jazz) music in that it does not idolise musicians – too much, and it probably makes it a little more realistic, too. After all, the world tends to be an unkind place to those creatively inclined, and yet another music prodigy – instant success story would not have been quite as effective. Instead, the film focuses on cutthroat competition: on tension during rehearsals, on everyone’s one singular aim of impressing the Master even if it means turning on each other. The fear and discomfort is tangible; it seeps through the screen and right into the audience. You learn to both hate and respect Fletcher – you will most probably not agree with his radical approach, and you will feel bad for everyone involved in these sessions. And you’ll most likely ask yourself if it’s worth this at all. Yet, you understand what he’s doing. And in time, you learn to somehow appreciate it even when you hate it. So how far do your limits go? Truth be told, Andrew Neyman is not the most interesting character you could ever have. He is simply ‘a guy’ who happens to have a talent, but there are barely any qualities that make him an amazing protagonist, really. And that’s the point: the normalcy of it all, the way it is not as separate from the ‘real world’ as some would like to believe. The more obsessed he becomes with his studies, the more he starts to set this separation for himself. And indeed, the better he becomes at what he does, the more unlikeable he becomes, until you’ll probably want to just punch him off the screen. There are no limits to his own obsession, no lengths that he wouldn’t go through to prove himself to Fletcher. And it’s a dangerous, dangerous game they’re playing.